Dr. Deborah Barnhart explains near term plans to ASSEC members. The Alabama Space Science Exhibit Commission (ASSEC) Executive and Business Committees met on January 16, 2019, to hear a monthly overview of activities at the U.S. Space and Rocket Center including Space Camp and Aviation Challenge programs. Please note that all information provided is from my personal recollection and should in no way be considered official information. Handouts are linked at the end of this post. Dr. Deborah Barnhart provided her CEO report which included a summary of recent and planned activities at the center. Dr. Barnhart revealed the new logo for the Apollo 50th anniversary exhibit that is currently being built and will be on display at the U.S. Space and Rocket Center to help celebrate the 50th anniversary of the Apollo 11 moon landing. The exhibit will then travel to other museums around the country as a revenue-generating traveling exhibit (Additional information can be found in the December 2018 meeting notes). Event planning for the 50th anniversary event is in full swing with a full listing of events located on the USSRC website at https://www.rocketcenter.com/Apollo50. In all, there are over 70 planned events taking place in the Huntsville/Madison County area. The committee members were updated on the success of the New Year’s Eve Mars Masquerade event that was a sellout with 600+ people. The food service and special event teams were given kudos for continuing to make the event successful year after year. Another special event gaining attention and kudos was the special 50th anniversary event for Apollo 8th’s Christmas Mission. The free event that had over 300 participants and took place in the Davidson Center on Dec 23, 2018. The event included music and a candlelight reflection of the Apollo 8 mission which made astronauts Frank Borman, Jim Lovell and Bill Anders the first humans to orbit the moon. 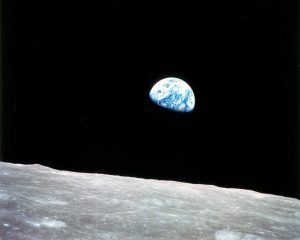 The mission was made famous by each astronaut reading from the book of Genesis and the photograph of Earthrise. Several promotional events were highlighted including the secret filming of a special segment of the Late Late Show with James Corden that featured The Lego Movie 2 voice actors Chris Pratt, Elizabeth Banks, and Will Arnett. The segment, which was filmed in one day, was featured on a special edition of the Late Late Show that took place after the AFC Championship game. While center personnel were excited about the airing on CBS affiliates around the country, they were more excited about the video being posted to the Late Late Show’s social media accounts. These accounts include over 17 million subscribers on YouTube. As of the publication of this post, the video had been viewed over 500,000 times. (You can watch it here in case you forgot to tune in). A location fee of $2,500 was paid to the center for the use of their facilities. Dr. Barnhart ended her CEO Report with a short review of a series of slides from the center master-plan presentation. The selection shown encompassed near term plans for a series of improvements that included a walkway or building connecting the old museum to the Davidson Center, making Tranquility Base (the road that runs across the front of the museum and Davidson Center) into a two-lane divided road that was labeled Tranquility Base Parkway. This divided road would eventually provide access to the new Exploration Park attraction planned in the hills behind the space center. Other items mentioned were the revitalization of Rocket Park and Rocket Row that is currently under restoration. Also in the Rocket Park area, an area around Moon Shot (aka Space Shot) would be the new home of the G-Force simulator and SpaceWalkers attraction thus creating the new Microgravity Museum/Amusement Zone. A new Space Camp building was also presented that would be an extension of the existing Educator Training Facility located near the Marriott. 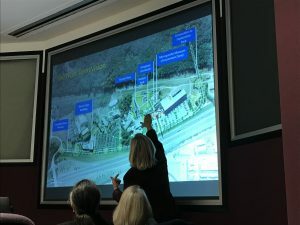 Committee members asked several questions about the near term plans and expressed interest in what it would take to make the connector to and from the museums a reality sooner rather than later. Some members expressed their personal history with attending functions and having to walk in the rain and other elements to travel between the two vital facilities. Museum metrics were presented that included a stats comparison 2018 vs YTD 2019. Museum staff stated that the downturn in the movie revenue was expected with the closing of the IMAX theater but was still less than expected. The bus tour revenue drop was due to a NASA related funding issue that was quickly resolved in December. Despite the partial government shutdown, NASA Bus Tours are still operating at Marshall Space Flight Center. 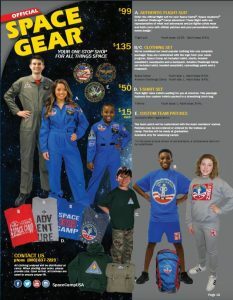 Camp prepaid sales were up with the introduction of new camp gear packages that include an all-inclusive clothing package and t-shirt package. Staff also mentioned that a snack package program is also in the works as well. Advancement income is lagging by $200,00 for preservations funds. But, has brought in $200,000 of Camp education development income. Museum admissions significantly ahead of last year and plan based on visitor counts. Special events and food service running ahead of plan. We are holding up well to the new external competition in the Huntsville/Madison area. Included in the R&M line, $400k of Saturn V preservation work that is to be completed but not earned. Correcting a significant timing issue. Outside services and other expenses are significantly favorable to plan due to staff primarily focused on donor/insurance projects. Some of this needed work will be completed in late Q2 or early Q3. Licensing income was a budgeted $175,000 from the South Korean Space Camp license. We remain hopeful this is just a slip of one or two months. Capital contributions are behind but, have always been had to predict. In new business, committee members heard status reports on two contracts. First the renewal of the NASA MSFC ETF lease extension. This lease is paid by NASA for the use of the Educator Training Facility located near the Marriott. The lease began in 2010 and has been renewed multiple times and includes several agreements for use of training and conference spaces as needed. This lease extension covers five option years for the use of the 2nd-floor office space (7,891 sq ft) beginning with the base year payment of $94,118 with an annual increase through the 4th option year (2022-2023) ending at $101,876. Both committees approved the lease after hearing additional details about the history of the lease as well as some discussion on how the lease would be handled if NASA terminated the agreement. The committee also was provided a vague update of a matter listed on the agenda as “NASA Claim”. This item was discussed in an executive session in the December committee meeting and resulted in the committees approving the firm of Bradley Arant Boult Cummings, LLP to seek recovery for some matter from insurance companies and/or NASA. While this matter has not been publicly stated in the meetings, it is believed to have something to do with a contract issue involving ASSEC, NASA and Space Race, LLC.. No action was taken by the committee during this meeting but the committee members appeared to be pleased with the initial draft for a “claim for prompt payment from NASA”. A few final nuggets that were also covered in the meeting that I found interesting. The employees are getting a new employee breakroom. This is something that has been overdue for 10+ years. Space Camp Underwater Astronaut Training staff have tested a new product called Sea Trek that involves the use of a full helmet with air supply provided by hose instead of air tanks. This is a major advancement for opening the UAT for more people who may who want to take part in the training opportunities of the tank and also helps those with certain medical issues move closer to being able to dive in the tank. It is worth noting that ASSEC Chairman, Homer Hickam and his wife took part in a demonstration dive to have first-hand experience on how the product works. Speaking of the UAT, it was discussed that the UAT facilities at the top of the tank will be getting a long overdue makeover as well. The U.S. Space and Rocket Center had the largest entry in the State of Alabama Inaugural Parade held in Montgomery. The center’s entry included 400 total people that were mostly made up of Space Camp program participants from around the state. The goal was to have one child representing each SALSA awarded scholarship given by State of Alabama legislators. Dr. Barnhart mentioned to committee members that the Space Camp entry received “recognition from the Governor’s cabinet including people that we may need in the future such as the State Auditor and State Attorney General”. Our @SpaceCampUSA Team showed up strong for today’s Inaugural Parade in Montgomery. Congratulations, @governorkayivey! The next planned meeting of the ASSEC Business Committee is Wednesday – February 20, 2019 @3: 30 pm. The full ASSEC board will meet on February 22, 2019 @ noon. Special thanks to the ASSEC staff for providing a copy of the agenda and handouts.